Even as the Ludhiana Municipal Corporation (MC) officials demolished 40 odd jhuggis amid tough resistance in the Model Town Extension area of the city on November 4, it seems encroachers are having a free run these days. This is so because jhuggis have once again come up on the same piece of land, as “political patronage” is believed to be the real story behind it. This despite the fact that a female Assistant Town Planner (ATP) was roughed up by a protesting woman, against whom an FIR was registered this evening. A big chunk of land, which is a green belt, was handed over to the MC by the Ludhiana Improvement Trust some years ago. During these years, some people, having political patronage due to vote-bank politics, encroached upon this land and started living there by constructing 40 odd Jhuggis. The land is located along the Railway tracks in the Model Town Extension area. On November 4, these jhuggis were razed by using a ditch machine and the MC officials had to face a tough resistance of the occupants of these jhuggis. When contacted, ATP Kamaljit Kaur said if the jhuggis had come up in the area again, she would get them checked tomorrow. “It’s government land and we would not let any person encroach upon it at any cost,” claimed Kamaljit. 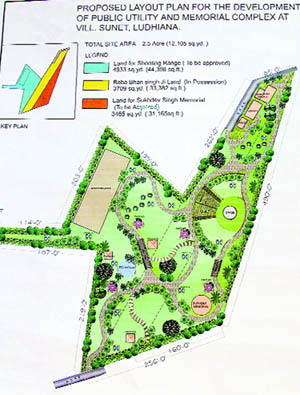 A big chunk of land, which is a green belt, was handed over to the MC by the Ludhiana Improvement Trust some years ago. During these years, some people, having political patronage due to vote-bank politics, encroached upon this land and started living there by constructing 40 odd jhuggis. The Ludhiana Municipal Corporation might land in a dock for using a kundi connection for running 21 streetlights in the old city area. A file photo of a bicycle rider passing underneath a maze of kundi connections in a street in the old city area of Ludhiana. Officials of the Punjab State Power Corporation Ltd (PSPCL) have “caught” the MC for using a kundi connection for running streetlights in Rupa Mistri Street and Gul Chaman Street here. Sources within the PSPCL said these streetlights were not even existing in their records, that is why these were disconnected. The PSPCL officials say as the MC is also a government department, they are still verifying whether these connections were authorised. “We want to be sure whether these were authorised. And if the connections are found to be unauthorised, a fine of Rs 1.5 lakh would be imposed on the civic body. But we would be able to know the exact status of these connections by Thursday,” stated MP Singh, executive engineer (City Centre division), PSPCL. A team of PSPCL officials had conducted a raid in the old city area yesterday. The raid was conducted in Soodan Mohalla, Rupa Mistri Street, Neem Chowk and Gul Chaman Street and around 50 connections were checked. But the PSPCL officials were shocked to know that there were 21 streetlight connections which were “unauthorised”. Presently, for running streetlights, there are no electricity meters installed and the PSPCL takes monthly dues by calculating an average. “But these 21 streetlights did not exist in our records, which was very surprising,” said a senior PSPCL official. On the other hand, MC officials say that they have not received any such information from the PSPCL. Taking strict action against the woman who assaulted Assistant Town Planner (ATP) Kamaljit Kaur, the Ludhiana Municipal Corporation (MC) has got an FIR registered against her. The FIR was registered against the woman, identified as Gultar, at Model Town Police Station. MC Commissioner AK Sinha had issued written orders to the police to book Gultar, after which MC officials reached Model Town Police Station and submitted a written complaint in this regard. ASI Gyan Chand of Model Town Police Station informed that on the statement of ATP Kamaljit Kaur, a case under Sections 353 (Assault or criminal force to deter public servant from discharge of his duty), 186 (Obstructing public servant in discharge of public functions) and 34 (Acts done by several persons in furtherance of common intention) of the IPC has been registered against Gultar. “We would now locate the woman and would make sure she is behind bars for manhandling a government official,” said Gyan Chand. Establishing Gultar’s identity was a tough task for MC, who had to visit the area once again and somehow managed to know her name from people residing in nearby houses. “After we came to know her name, I gave a written complaint against her with the Model Town Police Station,” said Kamaljit Kaur. While talking to The Tribune yesterday, Sinha had said that they would lodge a police complaint against the protestors, especially the woman who pulled the ATP by her hair. A big chunk of land, which is a green belt, was handed over to the MC by Ludhiana Improvement Trust some years ago. However, 40-odd jhuggis came up on the land. Accompanied by a heavy police force, a team led by ATP Kamaljit Kaur had demolished these jhuggis on November 4. During the course of this, the ATP was manhandled by Gultar. SR Kaler, Additional District Magistrate, Ludhiana, has passed an order under Section 144of the Cr PC 1973 that no person shall make any addition/alterations or carry out fresh construction in the restricted zone i.e. 1000 yards from the outer parapet of the ammunition depot at Badhowal. The order came into force w.e.f. November 8, 2011, and will remain in operation till January 6, 2012. Kaler said there had been cases regarding the raising of unauthorised constructions near Badhowal Army Ammunition Depot and there was apprehension that there might be further danger to human life and disturbance of public tranquility. Though the construction of new Labour Ward of Lord Mahavira Civil Hospital, Ludhiana has been completed it is yet to be put to use for want of inauguration and bureaucratic wranglings as the patients continue to be huddled together in the existing ward for want of space. Meanwhile, more than two patients are still sharing the same bed at the old labour ward along with their new borns. “We are just waiting for the ward to be operational. Once it is opened for patients we will have no problem as it can easily ate 20 beds,” said Parvinder Singh Sandhu SDO, Punjab Health System Corporation. He added the construction of this new labour ward was started about a year ago by PHSC. An amount of Rs 23 lakh has been spent on the contsruction. It can accommodate 20 beds easily. Earlier it was of 16 beds. But later the capacity was enhanced to 20 beds by adding four beds of nursery ward also. “Once it becomes operational there will be 36 beds in the labour ward i..e 20 beds in the new labour ward and 16 in the older one. SMO of the hospital Dr Karamveer Goel said: “The labour ward is ready but Punjab Health System Corporation has not handed over it to us. Without this we cannot make it functional." When asked as why PHSC delayed the handing over, Dr Goel said,"Actually employees of Civil wing of PHSC were on strike. Now it is over and hope that it will handover us soon." With the state governmentfailing to send the monthly grant of over Rs 7 crore to Punjab Agriculture University (PAU), its pensioners, employees and teachers have not been given pension/salaries for October. The state government had been releasing the grant by the fifth of every month during the past few months, but this time, the grant has not reached the university for reasons best known to the government. Those attached with the university maintained that the state government had again started “harassing” the employees of the university by adopting “delaying tactics”. “We had been facing the same problem till a few months ago. But with the efforts of the new Vice-Chancellor, things got streamlined and we had heaved a sigh of relief. However, the monthly grant has not been released this time. The university authorities have been sending reminders to the government for the release of the grant but nothing has been done so far,” said a university official, on the condition of anonymity. Those attached with the university feel in the absence of timely disbursement of monthly salaries, it will get extremely difficult to manage their households. “We have to clear the pending bills of ration, milk, etc. Besides, the tuition fee of children has to be given in the first week of every month. When we do not get the salary on time, things become really tight for us. The salaries/pensions have to be paid by the government every month. There should not be any delay in that,” said a non-teaching employee. Meanwhile, Sat Pal Gupta, general secretary, PAU Pensioners’ Association, has said senior citizens have blamed the state government for not releasing the pension (grant) in time. The association had organised its monthly meeting on the campus today. He said the authorities earlier used to make stopgap arrangements by arranging funds but this time they, too, had expressed helplessness in providing any solution. “We plan to meet the Vice-Chancellor tomorrow. Pensioners, at the fag end of their lives, need finances. Those getting meagre pensions are the worst affected. Many of us are suffering from several ailments. We must be given our pension on time,” added Gupta. Jobless veterinary doctors had called off their 11-day hunger strike on October 8 following an assurance from MLA Harish Bedi on behalf of the Punjab government. However, after a month of waiting and getting no response from the government, they have decided to start their protest once again. The veterinary doctors had started their protest on September 21 and sat on hunger strike outside the veterinary hospital gate on September 28. On October 8, the hunger strike was called off following MLA Bedi’s assurance that vacant posts of rural veterinary officer (RVO) would be advertised within 15 days. However even after a month, nothing had been done by the government. The rural devolvement and panchayat department had claimed that a new policy had to be formulated for recruitment. However, they have failed to formulate a policy. “Running from pillar to post, another delegation of jobless doctors had met with Deputy Chief Minister on October 24 and Chief Minister on November 6. They had agreed to look into the matter and directed to meet the minister concerned again. However, uncertainty still prevails. The doctors are left with no option but to intensify their struggle,” said Dr Manbir Singh. On a call given by the All-India Bank Employees’ Association (AIBEA), bank employees held a demonstration in front of the State Bank of India’s regional office at Miller Ganj here today. Federation leaders highlighted a 10-point charter of demands of the National Trade Union Convention and said “no” to the banking sector reforms. Naresh Gaur, secretary, Punjab Bank Employees Federation, said the government must take concrete measures to contain price rise and ensure strict enforcement of all basic labour laws. The government must adopt measures for linkage employment protection with the concession/incentive package offered to the entrepreneurs. Gaur said attacks on the banking sector were on the rise. “While we could push back the banking Bill during the monsoon session, the government will try to pass it in the winter session of Parliament. The RBI is likely to announce the New Bank Licensing Policy to allow industrial houses and corporates to start their banks. In the name of capitalisation of banks, the attempt is to increase private capital in the banking sector. But we will not allow this,” said Gaur. The employees demanded the amendment to minimum wages Act to ensure universal coverage irrespective of the schedules and fixation of statutory minimum wages at not less than Rs 10,000 per month. A function was organised at the Central Institute of Post-Harvest Engineering and technology (CIPHET) on the completion of a three-day training programme in soya milk and tofu today. The programme was aimed at entrepreneurial development and self-employment among the youth. He assured institute scientists’ support to the participants of the programme in case of difficulty in product development. Emphasising the maintenance of quality, Dr Deepak Raj Rai, head, transfer of technology division, said food safety standards and norms of the government should be followed during product development. “No harmful chemicals should be used, otherwise the product would not succeed in the long term,” he said. Dr Sangeeta Chopra, senior scientist, said nutritional benefits in soya products were quite high. She also took feedback from the participants. Rajat Bansal (17), a participant from Fatehabad district, Haryana, said the training had given him confidence to start a venture. “We will soon launch our own products,” he said. Only four teachers participated in the extempore competition on the first day of the two-day tehsil-level Science Competition held at Guru Nanak Public School, Sarabha Nagar, while only five teachers participated in the competition for creating and using teaching aids to make teaching interesting for students. According to District Science Supervisor, Santokh Singh Gill, many of the teachers are busy in the ongoing seminars related to the RMSA, so they did not participate in the competitions. "Extempore competition was withdrawn last year, so not many teachers might be aware about its resumption," he said. There were only four teachers in the extempore competition. The first two positions were secured by Pritpal Singh and Shyamli Waraich, teachers from Guru Nanak Public School, the host school. Preeti Bansal, teaching at RS Model School, Shastri Nagar, who stood first in the teaching aids competition presented a model on properties of magnet. Her model was designed to expain about magnets and properties from its discovery, properties, magnetic lines of force, its travelling through materials, attraction and repulsion. Quiz and essay-writing competitions were also organised as part of the event. About 44 teams representing different schools participated in the quiz competition, while 36 students from various schools participated in Essay-writing competition. The topics for essay-writing competition were Chemistry in Everyday Life, Chemistry and Environment, Chemistry and Human Body and Relation of Chemistry with Physics, Biology and Mathematics. Government High School, Ladowal, won the quiz competition, with Government High School, Mullanpur and Government School, Threeke, securing second and third positions, respectively. All events had the theme of chemistry, commemorating this year as the “International Year of Chemistry”. Gone are the days when residents used to procure weapons training certificate by allegedly greasing the palm of a retired soldiers and policemen. From now on, the applicant will have to undergo a physical training session and an intensive theoretical session at the Police Lines where they will be taught weapon holding techniques and safety procedures to be adopted. The step has been taken after the Deputy Commissioner of Police (DCP) Ashish Chaudhry found that residents were increasingly applying for arms licence without undergoing formal weapons training. Sources in the department said the DCP had recently summoned a resident who had applied for an arms licence. When asked about any prior training, the applicant replied that he had procured the training certificate by greasing the palm of a retired soldier. “It was astonishing to see scores of residents, who had never held a weapon before, procuring training certificates. It is not a toy that you buy for children. It is a very serious issue. I was surprised to see residents not taking due precautions while handling weapons. Awareness and proper education are crucial before one buys a weapon,” the DCP said. According to the guidelines, residents will be considered eligible a for weapons licence once they have undergone a two-day training session. It is, however, not mandatory for the applicant to undergo training at the Police Lines of the city alone. If the applicant has taken training at any other centre of the state, they will be considered eligible, he said. The training will be conducted under the aegis of the Rifle Plus Shooting Club and a minimum fee of Rs 500 will be charged from the applicants. On the first day, the applicants will be given practical training in holding, carrying and cleaning a firearm. They will subsequently be taught about the safety measures to be taken while carrying a weapon. Sources said the decision was taken following a spate in accidental deaths while cleaning a weapon. The misgivings on part of the railways authorities that the new Shatabdi train from the mega city to New Delhi, running via Sangrur and Rohtak, with an extra travelling time of almost an hour might not find favour with the frequent travellers has turned out to be unfounded, as the train is slowly gaining on the volume of passengers. Even on its maiden run when the train was uploaded on the main server of the railways just a day before its launch here on November 4, some 50 per cent seats in the chair car and almost the entire quota of executive class on the train was booked. The next day (November 5) also, around 200 passengers travelled in the chair car class of the train, while some of the seats in the executive class were also occupied. According to railways officials, the average occupancy of the new Shatabdi is hovering between 50 to 60 percent. "Today (November 8), more than 200 seats in the chair car are booked in advance, while the entire quota of the executive class is almost full, which indicates that the new train has gone down well with the frequent travellers," the officials commented. Another added advantage of the new Shatabdi to New Delhi, which, for the time being runs only on Monday, Tuesday, Friday and Saturday (four days a week), is that those planning their journey at the last minute, also stand a chance to get spot booking which in case of the two other Shatabdi trains to New Delhi was almost impossible. "On Monday (November 7), around 50 tickets of the chair car class of the new Shatabdi train were purchased by the walk-in passengers just before the arrival of the train," an official at the railway reservation centre said. That the frequent travellers to the national capital who want a comfortable mode of travel do not mind the small disadvantage of the train running via Sangrur and Rohtak, and a little extra travelling time was obvious from the remarks made by Rakesh Pahwa, a businessman who travels to New Delhi almost once in a week in connection with his export trade. "Since tickets were not available at a short notice in the evening Shatabdi running via Ambala and Panipat, most of the time, I had to travel by car which was nerve-wrecking. But with the new Shatabdi, there is no such problem since even the walk-in passengers stand a pretty good chance to get a confirmed seat in chair car or executive class. And for those travelling to New Delhi, the route does not matter," Pahwa observed. The online registration of new vehicles at auto showrooms began here today, with SDM Jagraon Isha Kalia formally launching the service for online registration of vehicles at AS Automobiles, the dealers of Hero Motorcycles. For getting the registration of the vehicle done, a customer will have to submit a fee of Rs 100 and 4% tax. The customer will only need to provide an identity proof of his to get the registration number issued. Apart from this, the customer buying vehicle from Jagraon can also get issued number of any other city through this service. The service will also provide relief to the customers buying new vehicles, as they will not have to make rounds of government offices to get registration of their vehicle done. People will no more have to stand in queues and wait for a long time to get the registration of their any vehicle done at government offices. The service will quickly provide the registration number of any new vehicle purchased by the customers at the showroom of any vehicle in the city. SDM Isha Kalia said the service would not only provide convenience to the common man but also reduce the workload of the transport department officials. “Besides, the beginning of online registration of vehicles at auto showrooms would also help reducing the corruption in government offices,” she said. A day after The Tribune highlighted the failure on part of the municipal corporation in checking encroachment on 5,500 sq yd of land allotted to the District Rifle Association (DRA) at Sunet village, Assistant Town Planner (ATP) Kamaljit Kaur visited the area to assess the ground reality this morning. Three houses were found built illegally on the piece of land. “Portions of some other houses also fall on this land and we have decided to send them notices to clear their position, failing which their structures will be demolished,” she claimed. MC officials also assured the DRA members that the encroachment would be removed soon. A meeting in this regard was held in the zone-D office of the corporation and it was decided that a boundary wall would be erected around the piece of land. Col JS Brar, DRA president, said the ATP, along with other officials, visited the scene in the morning. “She was convinced that encroachment existed on the land allotted to us. Later, we held a meeting with MC Commissioner AK Sinha, who assured of getting the encroachment removed soon,” claimed Colonel Brar. “Those living in houses, which the DRA officials claim to be encroaching on the land, will be served three-day notices. If they fail to submit a satisfactory reply, we will demolish the structures,” the ATP said. Last year, the MC had allotted 5,500 sq yd of land to the District Rifle Association for the construction of a shooting range, but the association had not been able to take possession of the land due to encroachment. The association members had brought the matter to the notice of the corporation many a time but to no avail. Now, an NGO, Maha Sabha Ludhiana, has proposed to develop a public utility and memorial complex that would house an open-air theatre, memorial to Shaheed Sukhdev and a park for area residents. Book released: A book, Rabb De Darshan, by poet and writer Tara Singh Aalam was released at Gujranwalan Guru Nanak Khalsa College here on Tuesday. The programme was organised by the Centre For Immigrant Studies and the department of Punjabi of the college. Manjeet Singh Chabbra welcomed Aalam. Harjeet Singh, director, Doordarshan Kendar, Jalandhar; Sawaran Singh, poet from Denmark; Sohinderjeet Singh, president, Gujranwalan Khalsa Education Council; Baldev Singh, a writer, were also present. In his book, Aalam, author of five other books, has shared his journey and tried to answer questions pertaining to the quest for life. It also focuses on the problems faced by Indians living abroad. Stage performances dominated the concluding day of the ongoing 53rd Panjab University Inter-Zonal Youth and Heritage Festival at Ramgarhia Girls College, Miller Ganj, here today. Jaswant Singh, deputy chief administrator, GLADA, was the chief guest. Punjabi vigour of folk orchestra, folk instruments, folk dances and ‘giddha’ were the highlight of the day. Besides, mime, skit and mimicry were organised at the school auditorium. Skits and mimes tried to find solution to the prevailing social problems. A skit by DAV College Sector 10, Chandigarh, was adjudged the best. They highlighted the ill-effects of excessive TV viewing by children and how they grew up with negative personalities as a result. Another skit presented the shallowness of BIG BOSS inmates and how the common man emerged the winner. In mime, themes included female foeticide and differently-abled children. The sensitive portrayal of these issues brought tears to the eyes of audience. Guests included Dr SM Kant, former director, department of youth welfare, Punjab University, Chandigarh; and Prof Rajpal Singh, president, Punjab Sahit Akademi. Hira Singh Gabria, minister for tourism and culture, Punjab, gave prizes to the winning students. He also lauded the role of the staff and students of the college for putting together the event. The four-day festival concluded with a vote of thanks by Principal Dr Narinder Sandhu. Individual prizes: 1 Gobind Rai (AS College, Khanna); 2 Sourabh Midha (DAV College, Abohar); 3 Arshad Iqbal (DAV College, Sec-10, Chandigarh). Mime (Group): 1 PG Govt College, Sector-11, Chandigarh; 2 DAV College of Education, Fazilka; 3 Guru Nanak Khalsa College for Women, Ludhiana. Folk orchestra (Group): 1 SCD Govt College, Ludhiana; 2 GGS Khalsa College for Women, Jhar Sahib; 3 AS College for Women, Khanna and GGDSD College, Hariana, Hoshiarpur. Individual prizes: 1 Jagsir Singh (SCD Govt College, Ludhiana); 2 Pratibha (GGS Khalsa College for Women, Jhar Sahib); 3 Mandeep (PG Govt College, Sector-46, Chandigarh). Movie on Sikh history: A movie on the life and achievements of Baba Banda Singh Bahadur was screened at GN International Public School, Model Town, by the Shan-E-Khalsa here on Tuesday. Principal Gurmant Kaur Gill thanked the organisation for organising the screening for students to educate them about their culture. Volleyball meet: The opening ceremony of the Inter-School Volleyball Competition among Sahodya Group of CBSE schools was held at Shifaly International School, Rahon Road, on Tuesday. Sixteen schools are participating in the tournament. Results: Saint Thomas b GNIP, GMT b Green Land School, Spring Dale b DAV Branch, DAV (BRS Nagar) b Green Land (Subhash Nagar), CFC b Green Land School (Sector 32), DCM Presidency b Shamrock School and Shivalik Doon Wala b Shifaly International School. Sports Day: Cherry Lane Play School, BRS Nagar, organised its annual sports day “Udaan” on Tuesday. The playground was decorated with slogans, balloons and flags. Children took part in a march past and performed a dance on patriotic theme. They later took part in races like friendship race, rabbit race, flag race, ball balance race. Wearing Anna Hazare caps, they also raised slogans in his support. Parents also participated in games like musical chair, couple race. Prizes were distributed among the winners. A thanksgiving speech was given by principal Charul Chowdhary. Children love automatic toys, but these children are busy creating and programming their own robots. Sat Paul Mittal School, having introduced robotics from this session, is seeing students finding the course interesting and engaging at the same time. The programme has been introduced from class VI onwards. Students till class VIII learn to assemble and operate robots through remote control, while those from senior classes learn to do programming. Garv Luthra and Shivam Kaushal are working on relay robots that will work together pushing each other, following a line. “It is interesting and easy to program robots,” said Garv. The software for programming the robots is based on C++. Another robot being created by Somya Kaushish and Shreyaa Dada from class VII can detect edges and follow a path. “This kind of robot can be very beneficial in hilly areas as it can detect edges, preventing it from falling into ditches,” says Shreyaa. “It has two LED sensors. One sensor sends the signal down and if the other doesn’t receive it back, it retracts and changes path,” she explains. A similar robot detects obstructions and changes path. “These can be combined to detect and remove obstacles as well,” said a student. A robot with two grippers can grip an object and go back to the original position. Sarabdeep Singh and Sachindeep Singh, who are working on it, explain: “It can be calibrated to pick an object of a specific colour. This one can pick a white object. If it needs to do the operation repeatedly, it can be programmed to create a loop.” As this is just the beginning of the course, students of the school will start participating in robotics competitions soon, according to Viney Sharma, head of robotics department at the school. “The programme will encourage creativity in students and help them take up robotics as a career,” he said. “It is the technology of the future. Students who gain knowledge now will definitely have an edge in the future,” he added. “In about 10 years, robots will find their place in everyday life as well. These are already being widely used in army and medicine,” he said. The Punjab Softball Association (PSA) will organise trials to select the Punjab junior boys and girls softball teams at the Ramgarhia Educational Complex, Miller Ganj, on November 12 from 10.30 am onwards. According to PN Passi, honorary secretary of the PSA, players born on or after January 1, 1997 are eligible for the trials. Aspirants have been advised to bring their proof of age certificates. The selected players will represent the state in the 24th Junior National Softball Championship scheduled to be held from November 25 to 30 in Chandigarh.